We are a camp for those players that are dedicated to growth; in their game, in their skills and in themselves. To see the kind of results we are talking about will take: focused, consistent, hard work and dedication, on and off the ice, on your part and ours. 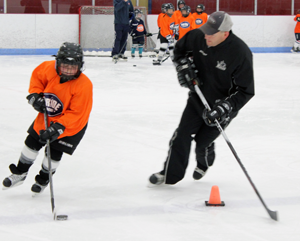 Through our intense and highly personalized on ice skills program we are always guiding you toward a goal of measured improvement and a greater level of achievement. PLAY WITH PRIDE! PRACTICE WITH PRIDE! COMPETE WITH PRIDE! THE GAME HAS CHANGED. The ice has opened up. Speed, stamina and on-ice conditioning are the keys to success in today’s up-tempo game of ice hockey. PRIDE recognizes this and has designed specific programs centered on each of these critical elements. Our staff has been carefully recruited, each member is handpicked and has extensive experience in the world of hockey and developing young players, both on and off the ice. At PRIDE we do not teach dedication and discipline. We instill it. We are a program that teaches each player how to reach down deep within themselves and harvest their full potential as both a player and a person. No tricks. No gimmicks. Just straightforward hard work! 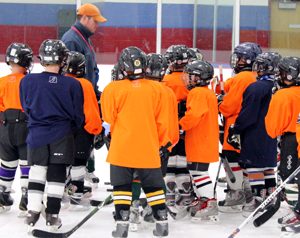 Players will learn the joy and satisfaction that comes from their hard work and personal development both on and off the ice. This is for players who take PRIDE in their improvement and are willing to pay the price.